Butterfinger is back. Today, the brand announced its return to the Super Bowl, after sitting out last year, and the launch of its "Bolder Than Bold" campaign in, well, a big and bold way. The brand nabbed professional skydiver Carson Schram from NorCal Skydiving to deliver the announcement while jumping from a plane at 12,000 feet. The entire stunt was livestreamed via Periscope, giving everyone a chance to catch the airborne announcement as it happened. "We thought long and hard about the best way to broadcast this fun-filled announcement, and we wanted to go as bold as possible, which led us to a live broadcast via Periscope," Butterfinger marketing manager Kristen Mandel told Adweek. 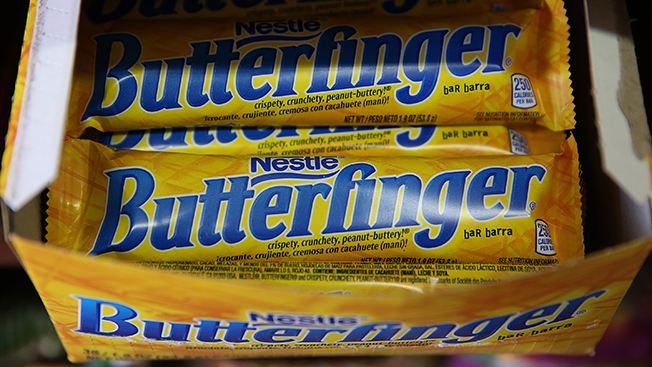 Butterfinger, the only Nestlé brand to ever advertise during the Super Bowl, will air a 30-second spot during the third quarter of Super Bowl 50 on Feb. 7, 2016. WPP creative agency Santo will create the ad, and Armando Bo, co-screenwriter of the Academy Award-winning film Birdman, will direct. Butterfinger won't divulge any details about what viewers can expect in 2016, but the brand promises no matter what it releases, it will be big and bold. "Today's 'bold' announcement is just the first step in Butterfinger's quest to take bold and make it even bolder in a way that is guaranteed to make you laugh," Mandel told Adweek in an email. "We wanted to get everyone's attention and get them thinking about what makes eating a Butterfinger bold and unlike any other eating experience."